This grain-free stuffing is so delicious that even those who think they have to have a bread stuffing enjoy it. This recipe is good for gluten-free eaters and for the paleo diet too. Also, a grain is not best with a protein meal as they grains and proteins conflict with each other in the digestive system. Since learning about food combining I always keep them separate. 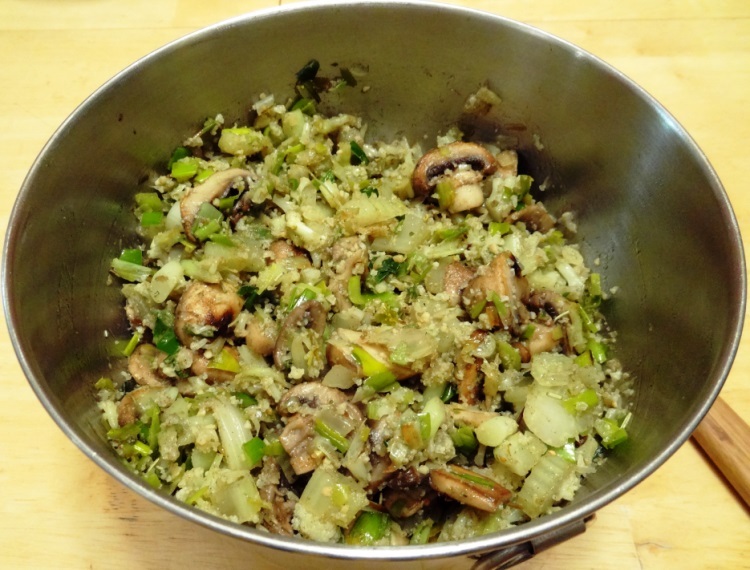 In a pan sauté the mushrooms, leek, and celery for about 5 minutes, until the mushrooms soften a bit. In a pot add a cup of water and bring to a boil, add the cauliflower and steam it until it is a little soft, remove it from the pot and let cool. When it is cool, chop off the top of the cauliflower into small bits and put into a mixing bowl. Mix in the sautéed mixture with the garlic, thyme, sage, and Spike. Put the mixture into a loaf baking pan (approximately 9 X 5 inches). Bake for 45 minutes at 350 degrees. Raise the heat to 375 degrees and bake another 35-45 minutes. 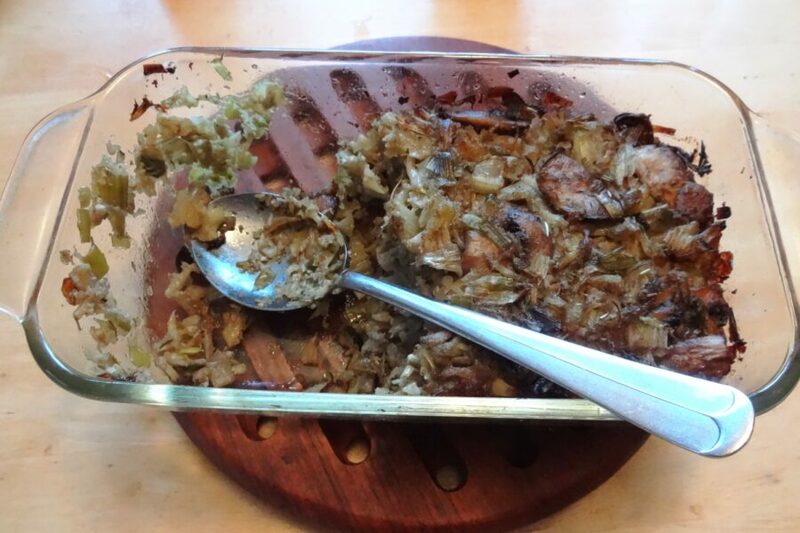 You can prepare this stuffing a day ahead as I did and then bake it on the day of the meal. Also, you can bake it for 1 hour and then cover and finish baking it before serving. Cranberry Celery Onion Gluten-Free Stuffing – This delicious gluten-free stuffing makes a holiday meal special and memorable. Try this healthy recipe and you will satisfy both the difficult and easy to please! 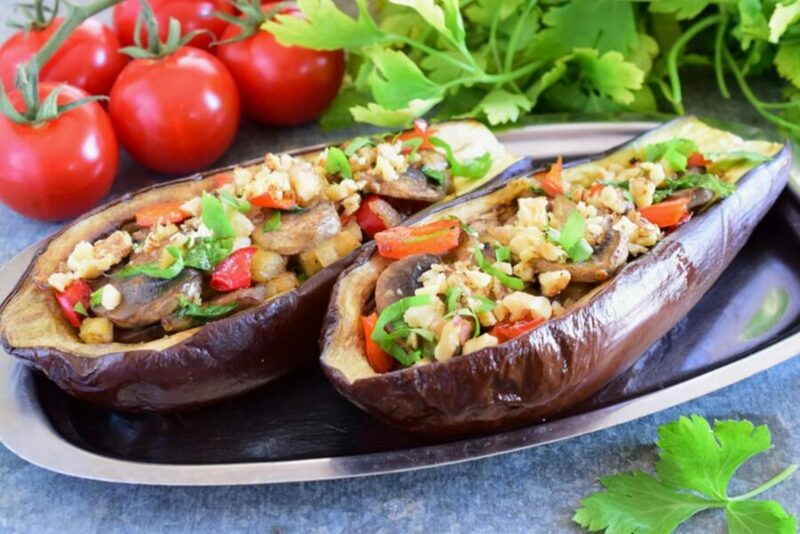 Delicious Stuffed Eggplant for Your Dinner – This stuffed eggplant makes a delicious savory main course for dinner as it is so filling and it is super easy to make. It can even be a side dish in a fancy meal. If you are vegetarian have this and skip the stuffed you know what.